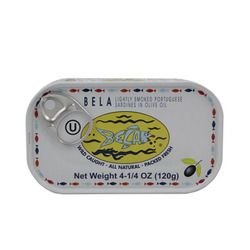 These sardines contain calcium - 30% of the daily recommended amount in one 4.25-ounce tin (a 3.5-ounce serving has more calcium than a cup of whole milk). Sardines are rich in coenzyme Q-10 and omega-3 fatty acids, plus a spate of vitamins and minerals. Coenzyme Q-10 can stave off heart disease, high blood pressure, cancer, even depression. Omega-3 fatty acids aid the body in transferring oxygen, help with muscle elasticity, brain activity and are a positive influence on the blood vessels and heart.